Some of you may recall that last September - the 1st actually - after twenty nine years of sitting in my garage, 1971 Mini Estate GYT 648J left for a new home. Well it is being seriously worked on - at great expense. Hopefully you will be able to see the "work in progress" and it is certainly progressing. If you click on the link at the bottom of the photograph you can see that progress. Last edited by bulleidboy on Wed Mar 27, 2019 8:39 pm, edited 3 times in total. Fantastic BB, bet you wish you were getting it back. I bet you are glad you're not paying for it. No - I'm happy that it's going to a new home. When I had the original spec. sheet from M-Tech, we considered having the car restored, I didn't bother with the sun-roof, and I got the restoration cost to £31,000 - I think the sun-roof was another £1500 - so someone is spending a lot of money. The guy who is "M-Tech", said that with his preparation, he would expect the car, if carefully looked after, to last another fifty years! Is that the same one I saw on the Goodwood festival program on TV yesterday. 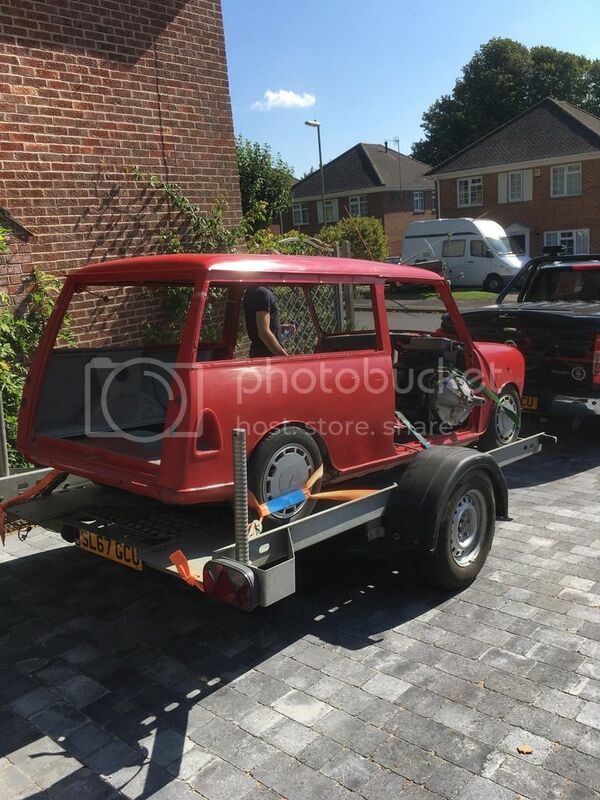 Same original state, loaded into a racing car transporter by a couple of dodgy looking blokes, then restored to racing trim complete in red with woodwork trim for the pre-66 Mini racing. I had to send a new V5 to the guy doing the restoration. He informed me that the car is being built for a businessman who lives in USA and London but plans to keep it in the UK - and hopefully retain the original registration number. I can't wait to see it finished. I found the price list - if you wanted a basic mini/mini countryman estate, M-Tech source a suitable donor vehicle and rebuild it - new engine, gearbox, brakes etc. that would cost you £18,795.00 - then you go down the options list (see below). The price soon mounts up. My old car is getting the full works - wood frame, sunroof and big engine. That is one heck of an options list Barry - but a heated windscreen on a Mini? The world has gone mad!